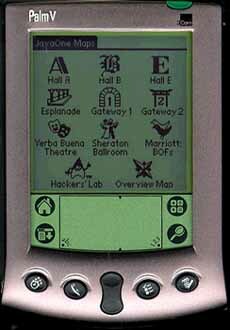 Other info: This was another KVM demo for JavaOne99: conference-goers could load a set of games and maps onto their Palm Pilots. In addition to the maps of the area shown below, I did graphics for Battleship and Blackjack games. This demo went over really well, too. I never would have thought that a usable map of San Francisco's Moscone Center and vicinity would fit in 160x160 pixels (in black & white, no less), but that's what I did. The following are some of the complete set I designed, including some fun icons to identify the different rooms.